About PIJUSHI Welcome to PIJUSHI Amazon Official Store. 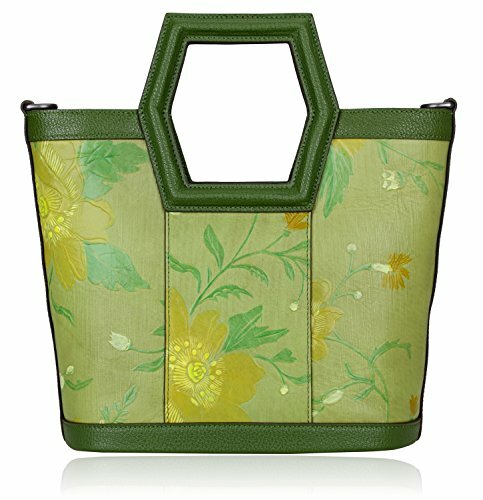 PIJUSHI is a fashion original designer brands, and always committed to designing and creating unique fashionable high quality handbags that continually redefine timeless style. Attention Please: PIJUSHI Co.,ltd is the only official seller on amazon,we never authorize to any other sellers to sell our products,so for your satisfied,please buy the bag from our official store. About this itemStyle handbags designed by Jones that goes effortlessly from work to party. Imported leather with embossed flower.Accented with a convenient long leather strap,Interior features large space for storage, 1 open pocket in one side, and one zipper pocket in another side; Basic Information: Outer Material: Leather Inner Material: Fabric Closure: Zipper Size :Size: L13" x W5" x H10.5" with 4.5" height handles, with 45" adjustable & removable shoulder strap Net Weight:1 kg(2.2lbs) Remarks:1.A bit new leather aroma is natural cause our product is made of top quality Genuine Leather, just open and put it in ventilate place for hours,the smell will fade away; 2. Our handbags are used good top grain cow leather(100% genuine leather in outside), so our handbags will have a little heavier than these PU or PVC leather handbags; About our service:1. 24 Hours Customer service: If you have any problem with our handbags or service, just feel free to email us, our customer service team will reply you email ASAP , and solve your problem effectively,make you happy shopping with PIJUSHI.2. 30 days free return service: If you are not satisfied with your purchase, items can be returned within 30 days of receipt of shipment in most cases. Return the eligible product in new and unworn condition in the original packaging for a full refund in accordance with our return policy.